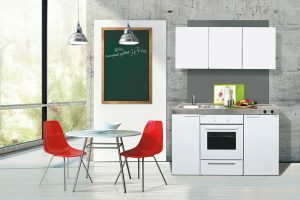 Requirements for the ideal kitchen differ, which is reflected in the equipment as well as in the design and materials. 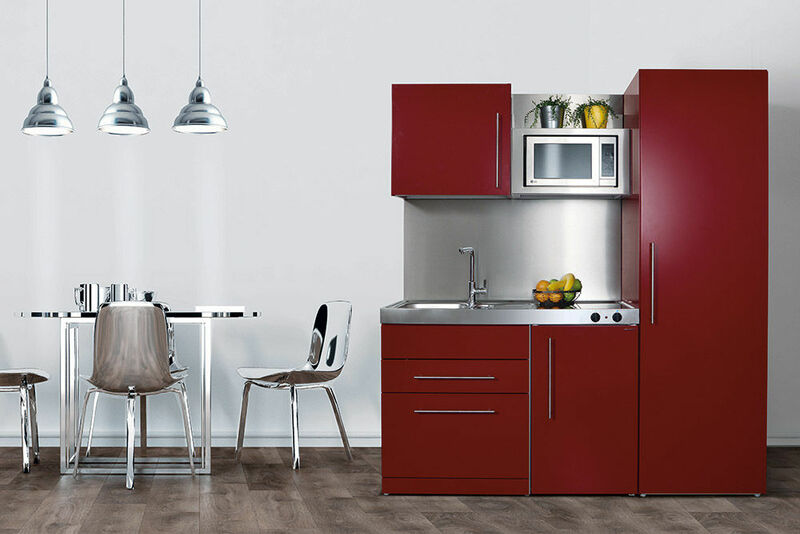 As a specialist for mini kitchens, our online shop presents the entire variety of this well thought-through set-up, offering you vast options, from a wooden look to elegant metal designs. One glance at our website and our different kitchen models will quickly show you that the reduced shape does not restrict you in any way compared to large-size kitchens. Stove, refrigerator, dishwasher or hand sink are part of our mini kitchens just as cabinets and shelves, space for crockery, decorations and much more. If all these elements need to be installed in a confined space, the kitchens can be fitted in an upright position to utilise the height of the kitchen to store all your kitchen utensils. Another great idea is the cabinet kitchen, which is easy to lock up when its not in use and integrates seamlessly with the living space, hiding the kitchen. Of course all components are available individually. Let yourself be inspired and choose what meets your individual requirements. Requirements for the ideal kitchen differ, which is reflected in the equipment as well as in the design and materials. As a specialist for mini kitchens, our online shop presents the entire variety of this well thought-through set-up, offering you vast options, from a wooden look to elegant metal designs. You already save space when fitting a kitchen in miniature format, without losing comfort and convenience in the daily use of the space or kitchenette. Your new kitchen, equipped to your requirements and with the latest technical components, is guaranteed to bring you great joy and you will treasure the long-lasting quality furniture piece purchased from us. By the way, you not only save space in your premises, but also money when purchasing a kitchen at reasonable terms from our vast online range.